Murray, with his wife Emma, farms at Culcairn in southern NSW producing wheat, canola, barley, prime lambs and beef cattle. Murray has an interest in the use of management and technology to make agricultural systems more sustainable and resilient. In 2011 he was one of the first Australians to complete The Executive Program for Agricultural Producers (TEPAP) which is run by Texas A & M University. He has been a member of the steering committee to form a grower owned local grain company, and was the founding chairman of his local Landcare group. Murray was awarded a Nuffield scholarship in 2008 looking at the sustainability of weed management systems, especially herbicide tolerant genetically modified crops. 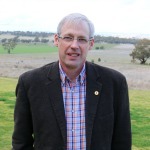 He was a director of Nuffield Australia for seven years (2009-2016) and held the roles of treasurer and chair of the Finance and Investment sub-committees. He has presented at the International Weed Science Congress, the The Australian Institute of Agricultural Science and Technology GM crops seminar, The Asia Pacific Weed Science Society conference and ABARES Outlook 2014.